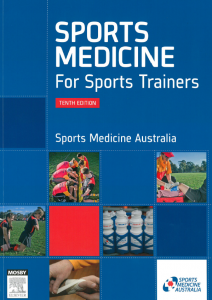 Sports Medicine for Sports Trainers provides an easily accessible, comprehensive and highly illustrated introduction to sports medicine and is the leading reference text in its field. Whether training for certification or accreditation as a Sports Trainer, or seeking an up-to-date manual on athlete care in a community sports context, this text makes all the information available in one handy resource. The manual is available for purchase from SMA. Please contact smanat@sma.org.au to purchase a copy or for further information.